What Day Of The Week Is November 9? 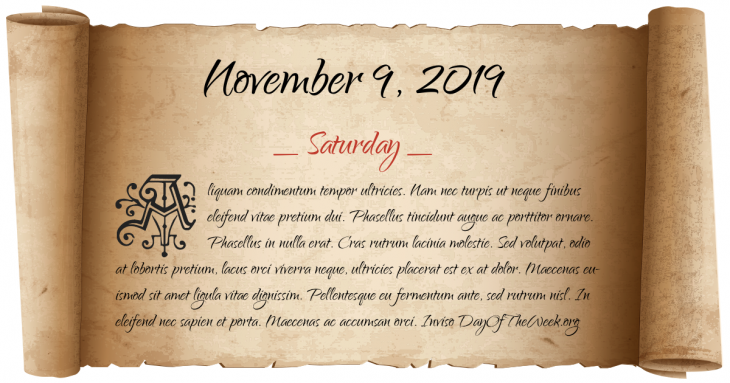 November 9, 2019 is the 313rd day of the year 2019 in the Gregorian calendar. There are 52 days remaining until the end of the year. The day of the week is Saturday. Ulrich II of Celje (Slovene: Ulrik Celjski, German Ulrich von Cilli, Hungarian: Cillei Ulrik), last prince of Celje principality, is assassinated in Belgrade. American Revolutionary War: In the Battle of Fishdam Ford a force British and Loyalist troops fail in a surprise attack against the South Carolina Patriot militia under Brigadier General Thomas Sumter. Foundation of the Dublin Society of United Irishmen. William Carey reaches the Hooghly River. Napoleon Bonaparte leads the Coup d'état of 18 Brumaire ending the Directory government, and becoming one of its three Consuls (Consulate Government). Apollo program: NASA launches the unmanned Apollo 4 test spacecraft atop the first Saturn V rocket from Cape Kennedy, Florida. Who were born on November 9?